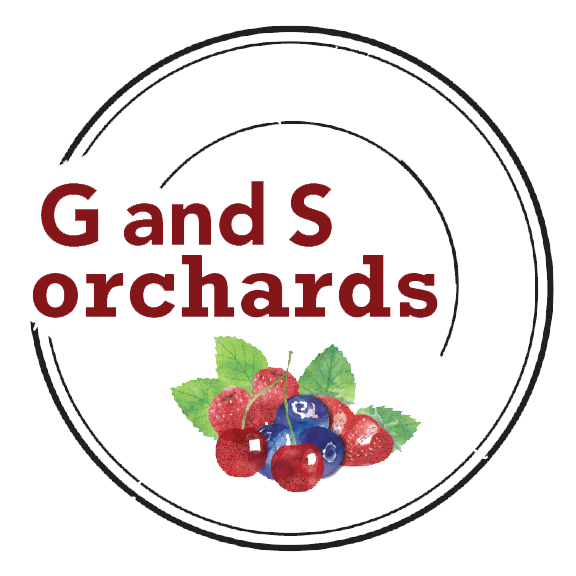 The 2019 Juneberry season starts Late June. We are one of the only farms in the Northeastern United States with You Pick Juneberries, also known as Saskatoons. Juneberries are available for You Pick in late June. 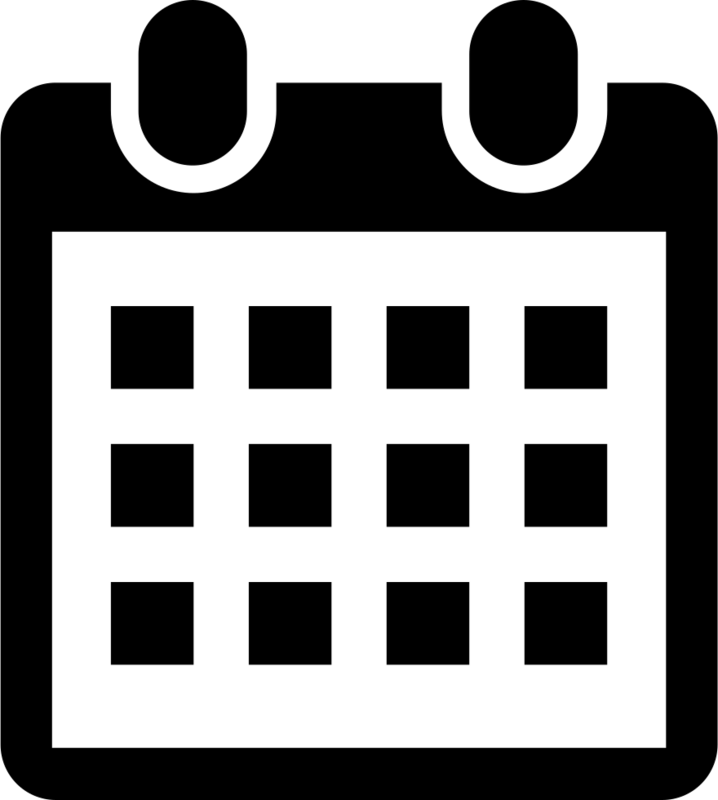 The season is a short one and generally is limited to 3 weeks. Already picked Juneberries are available at the Farm Stand. Smoky Juneberries are a sweet berry that is full of fresh flavor. JB-30 Juneberries are a larger berry great for fresh eating, sauces, dehydrating, baking, and dessert toppings. Martin Juneberries are a milder berry, easy to pick and versatile for many uses. The Juneberry is a tasty and nutritious berry native to North America. 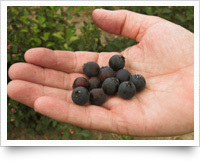 Juneberries were consumed and preserved by native North Americans for nutrition and medicinal uses. Juneberries are excellent to eat fresh. The flavor of the fruit is similar to Sweet Black Cherries or a Mild Blackberry, with a hint of Almond in the tiny soft seed. They are easy to pick and will keep well under refrigeration for several weeks. Juneberries can be frozen and used in all types of recipes. They hold their shape when thawed. If your recipe calls for Blueberries you can substitute Juneberries. Juneberries have a certain heft that make them filling. Juneberries are truly nutrient-dense, with high levels of protein, calcium, iron, and antioxidants. A typical Juneberry is 18% sugar and 80% water, which is a lower moisture content than Blueberries, so they have slightly higher levels of caloric value, proteins, carbohydrates and lipids. Juneberries contain relatively large amounts of potassium (twice as much as Blueberries) and large amounts of magnesium and phosphorous. Juneberries are an excellent source of iron providing about 23% RDA. They contain high levels of phenolic compounds, particularly anthocyanin. Juneberries have about as much vitamin C, thiamin, riboflavin, pantothenic acid, vitamin B-6, folate, vitamin A and vitamin E as Blueberries, and also trace amounts of biotin. 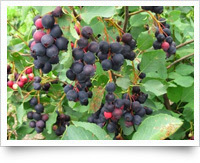 Learn more about Juneberries through Cornell University Cooperative Extension. Fruit is fragile and should be placed in the containers. Never drop or toss, it will bruise. Do not pick under-ripe fruit. It will not get ripe or sweet once picked. Juneberries will keep longer if berries are picked individually. Do not grab a handful. This will smash the fruit. Refrigerate your berries as soon as possible. Always wash your berries before eating.